Before you can make or build anything you must place your Corporate Headquarters. Placing your headquarters can be done in the "Corp HQ" section under the "Corporate" Tab. This structure can mine any resource, manufacture any product and build other basic units and structures but it can only do so in small quantity. The placement of your Corp HQ also significantly affects the production efficiency of your other structures in the same location, planet or system. The exact location of your Corp HQ also is the only place you can be elected as a governor of a city, planet or system. Your Corporate headquarters can be re-located but at a cost that scales with the net worth of your entire corporation. It is recommended that you place this structure at a well populated location; both city population and player population, which also has decent values of a few different resources in which you intend to specialize in. Be careful if you choose to place your Corp HQ at a location with no city as you will need a transport unit to move your products to a city to sell to. Your Corp HQ can mine any resource in small amounts but can also build specific mining structures that can produce much more. Higher value resources are usually found on other planet types that specialize in those resources, Chemicals on Toxic planets for example, but you must consider that these planets usually have low values of everything else which could prevent you from selling other resources easily if the prices change dramatically. Your Corp HQ gives bonuses to production for nearby structures, this is almost necessary to be profitable and keeps corporations tied to the areas in which their Corp HQ is located. All production in the same location as your Corp HQ get a 25% efficiency bonus. Any production on the same planet as your Corp HQ gets a %15 bonus. And any production in the same system as your Corp HQ gets a 10% bonus. You can also increase the bonus for different categories of products by leveling up your Corporation explained below. The bonus affects the cost it takes to run the structure producing the goods. The cost per turn is divided by 1 + (bonus as a fraction). For example a structure normally takes 1000 credits a turn to run, at 25% bonus it will take 800 to run and at 100% bonus it will take 500 (half) to run. Your corporation can be upgraded to a maximum level of 10. Each upgrade makes the bonus your Corp HQ gives to nearby production bigger. It also provides another research point which you can use to further increase the production efficiency of a small category of products everywhere in the galaxy. 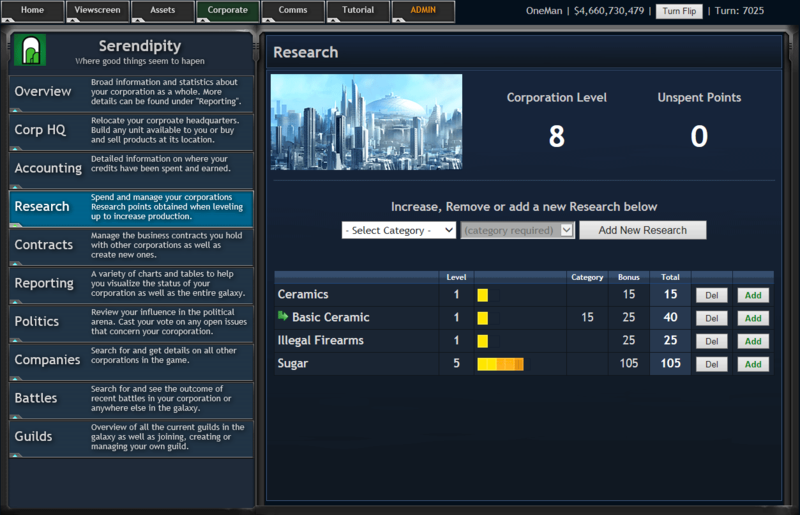 These points can be moved to other categories from the Corporate >> Research screen. You may remove one point back to your unspent points and apply it elsewhere every 100 turns. There is a limitation on how many structures and how many military units you can have at one time before a penalty to their cost begins to accumulate. This is known as your logistics penalty, it is displayed at the top of the Assets page and it goes up with your Corporate HQ level. Every level increases your maximum structure logistics by 10 points and your military logistics by 50 points. Every level of structure your corporation has costs 1 point and every level of your military units costs 1 point. Ships use their size stat instead of their level to determine how much logistics they need. For example, if your corporation had 2 level 4 structures that would cost 8 structure logistic points and if you had a level 2 and a level 5 ground unit, that would cost 7 military logistics. If you also had a Destroyer which is size 3 then your total military logistics would be 10. For every structure logistics over your maximum your corporation will have a 1% cost penalty applied to ALL your structures and for every point of military logistics over your maximum ALL your military units will incur an increase upkeep cost of 1% per point over. The percentage cost penalties are displayed along with the logistics scores at the top of the Assets page. At a 100% penalty you will be paying twice the normal upkeep cost of all your structures or military units. Your currents funds can go into the negative. When this happens you won't be able to pay for upgrades or make buys but you can still pay for upkeep which includes whatever it takes for your structures to run even if this would put you into further debt. You pay interest on your negative funds as if they were an automatic loan. The interest rate is charged every turn and is approximately 20% every 1000 turns (about 1 week real time). If you can't get your funds into the positive it can quickly snowball. Once your negative funds exceed your net worth you will go bankrupt. When this happens your corporation will be liquidated and all your assets will be sold for their salvage value. Your corporation will have those credits and nothing else. You can place your Corp HQ, which retains its current level, and start again.